Fantastic Beasts: The Crimes of the Grindelwald is the second instalment of J.K. Rowling’s Harry Potter follow-up series. After the success of the wonderful Fantastic Beasts and Where to Find Them, can the sequel hold itself against it? The short answer is, not quite. The film takes place a few months after the events of the first movie. 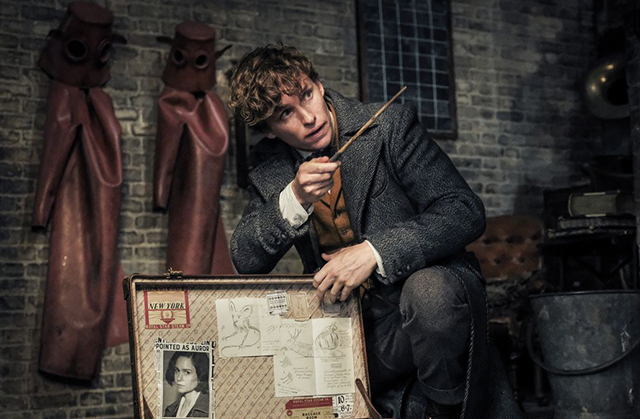 Newt Scamander (Eddie Redmayne) has returned to London to his work as a magizoologist after his adventures in New York. Grindelwald (Johnny Depp) is continually gaining support in Paris, and indeed, all across the wizarding world, and continuing his search for Credence (Ezra Miller), a boy with mysterious powers. The Crimes of Grindelwald is an almost excellent film. Eddie Redmayne is a joy to watch, as always, and Jude Law is a wonderful choice as a young, albeit underused, Albus Dumbledore, but they don’t rescue the film from its weaknesses. It tries to accomplish too much. It has several plotlines, but they just don’t quite mesh together. The film follows Newt Scamander and his adventures with magical wildlife, but is also about defeating Grindelwald? Is it about saving a vulnerable from the clutches of an evil wizard? It works to a certain extent, but there is a feeling of an information overload within this film. We are introduced to a raft of new characters, which for the most part, are completely irrelevant. They’re underdeveloped and add nothing to the plot. The first film succeeded with this approach, because it focused on Newt himself. A simple plot; magical David Attenborough loses his magical animals in New York City, and has to retrieve them. The film was worsened by adding the unnecessary and convoluted subplots about Grindelwald and Credence. In the sequel, this problem has reached a new level. There are two or maybe even three films happening in one. One is the lighthearted adventure of Newt, his buddy Jacob, his animals and love interest Tina. The other, a dark thriller about an evil wizard gathering power amongst the normal population, while searching for a boy of unparalleled power. Grindelwald is a good villain; Johnny Depp may just be playing Johnny Depp, but in this case at least it works. A particular highlight is the rally scene; calling to mind memories or images of the Trump rallies or even back in the days of Hitler. There is a certain amount of fan-service in the film. Without giving too much away, a beloved character from the Harry Potter series makes a return, along with some name dropping that will please the loyal fans. One shot in particular is wonderfully nostalgic, the classic pan across the mountains over to the Hogwarts castle, accompanied by famous theme tune. We also learn about the interesting backstory of an unexpected, yet important character in the Harry Potter series. The series is hard to compare to its predecessor. J.K. Rowling is credited as the writer, and David Yates, who directed the final four Harry Potter films, and the first Fantastic Beasts takes directorial reins. Obviously, the source material is not at the same level, but this is still an incredibly enjoyable film despite its flaws. The chemistry between Eddie Redmayne and Dan Fogler is lots of fun, and the beasts look fantastic, as you could well imagine, with the baby Nifflers a highlight, a range of soft toys waiting to happen. All in all, this is not a perfect movie. It is convoluted at times and tries to accomplish too much in too little time. It does have a certain charm however, and Potterheads will inevitably enjoy it.